I've been really into nail art for the past months but just haven't had the time to experiment since I began lurking in the Soompi forums and gotten inspiration from the many nail blogs i read (see my blog list). I am nowhere near as talented and patient as the other ladies but here are some of the the designs I've been sporting lately. For these nails i used Rimmel 60 second Be a Star for the tips, CM nail art in silver glitter and Seche Vite for top coat with a flowery Pink Fin brand nail sticker. I find Rimmel nail polishes to be really good and for a reasonable price too, I purchased most of mine at Priceline in their 3 for 2 sale some time ago. The colour range is good and the polish doesn't tend to chip much. 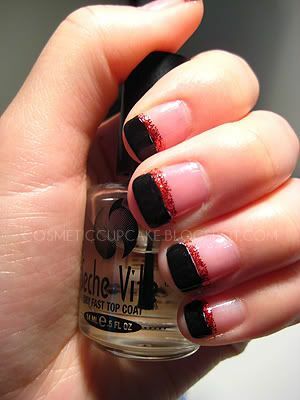 For these I used Rimmel 60 seconds vinyl shine in black out for the tips, CM nail art in red glitter and Seche Vite as top coat. These weren't the best because after i painted the red glitter I painted an extra line of white but I changed my mind after doing it and painted the tips black again haha. These fimo fruit nails are my version of the lovely Nikki's nails over at Askmewhats from her fruity fimo nails tutorial from last year. I purchased my fimo sticks from ebay as they were the cheapest and then cut them myself into thin pieces. They come in soooo many different designs like flowers, animals etc. and I'll post my collection another day as I just recieved my latest fimo haul from ebay today =p I am totally obsessed with fimo!! I used a base coat of OPI Passion and CM nail art in Pearl and Gold glitter on the tips. I then used my thick Clinique All in one base coat to adhere the cut fruits to middle of the nail before using OPI Top coat. 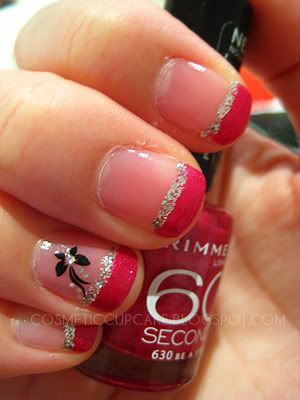 Stay tuned for my Valentines nails next! 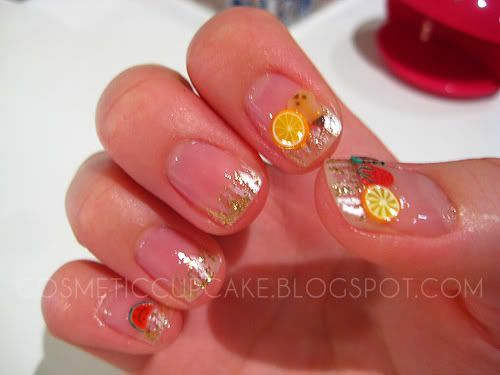 Your fruity nails are so cute! @ Annoii: Thankyou! You should try them out yourself, you will find them very addictive. 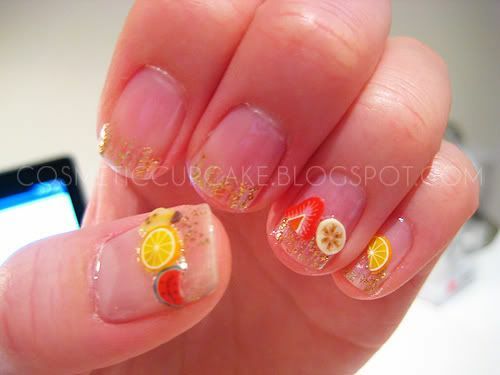 Oh my god I just love your fruity nails!